Well designed digital action role-playing games captivate their players with a "hook" — an extremely satisfying action that the player can perform and receive immediate feedback on how well they did. I wrote about these hooks a while back and how they're powered by instant gratification. A well designed action RPG gives players many different choices to explore in order to find the hook that works for them. 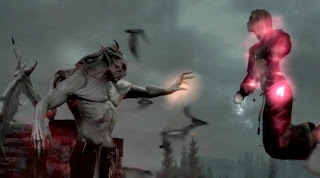 Skyrim is a great example here: players can choose to fight with several different types of spells, swords, shields, bows, daggers, hammers, or fists, and each of these choices provides drastically different combat gameplay (and hooks). When an action RPG provides the player with a captivating hook, that is what brings the player back for more; it is what she wants to do when she longs to play the game. Designing a powerful hook into a game, getting the player to desire that gameplaying, and then denying the player the ability to use that hook is the cardinal sin of action RPG design. Below I'm going to discuss three games with powerfully designed hooks, each of which prevents the player from using her hook in different ways. The Borderlands series of games do a fantastic job of designing great hooks. 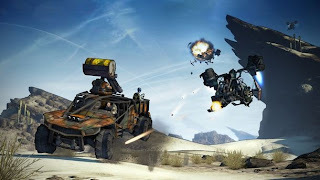 If you don't know, Borderlands and Borderlands 2 are both first person shooter role-playing games (FPS RPGs) for both console and PC, and designed to be played cooperatively by up to four players. Each game features four classes (in theory one for each of the players), and the first hook in the design arises from the fact that the game was designed for console in addition to PC. In many RPGs on the PC, each class unlocks tens of distinct abilities to use on their enemies throughout the course of the game. 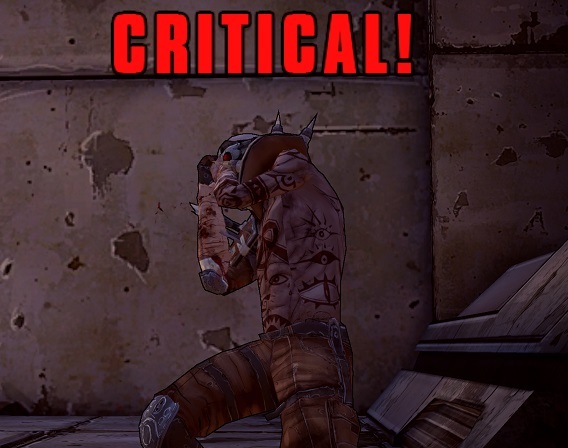 Interface-wise, this becomes difficult on consoles, so Borderlands has a clever solution: players are given exactly one skill, which they modify throughout the course of the game. One ability makes the character invisible, and then deals extra damage when he breaks the invisibility. Another sends the character into a melee rage that makes him deal extra damage and regain health when in the midst of enemies. 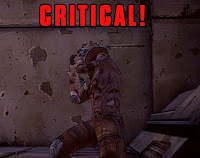 When coupled with the fact that Borderlands subscribes to the model of swarming its players with damaging but easily killable enemies, this single skill mechanic is ripe to be turned into a captivating hook, because it means when you activate your single ability, enemies almost immediately die. And then the creators of Borderlands 2 decided to add driving quests to the game. Don't get me wrong, there's nothing wrong with the driving mechanic. Players are at intervals expected to use armed and armored cars to get around increasing large and open levels. This part of the driving mini game is actually quite fun, and driving in these cars (particularly using the turbo function) begins to create a new hook for the game. Unfortunately, things begin to go wrong from a design perspective when several main missions require the use of the card to chase down and kill enemies. Up until these missions, cars were used for travel to places where you would use your action skill. During these quests, however, players cannot really use their action skills at all; the missions are balanced such that attempting them by foot is difficult or impossible, and so they must use the (rather uninteresting) turrets built into the cars. I understand the thought process that led to these missions: "We have these cars, we should change things up a little and make players use them for a couple of missions!" But, sadly, "changing things up" is not a good idea when it denies players what they are looking for in your game. Gee, I am SO glad I can't use the character I've been building for the past ten hours to complete these missions! Borderlands 2 is a fantastic game, but it could be made better by omitting main missions that require car combat (or making them sidequests). Skyrim takes almost the opposite approach from Borderlands when it comes to hooks; instead of giving the player exactly one hook that is built to feel awesome, Skyrim gives players the option to choose the combat hook that works for them from a long list of possibilities: summoning units, shooting fire, controlling enemies, walloping people with hammers, stabbing them with daggers, shooting them with bows, etc. While some of these hooks are more compelling (at least to me) than others, there is something for most people in the game. Personally, as I've written before, I always have played the stealthy bow character. There's just something that does it for me about loosing an arrow, watching it fly (perfectly aimed) across the cave to embed itself in an unsuspecting bandit's throat, and feeling satisfied when the bandit tumbles forward off his ledge into the pool below, dead. I was pretty sad, then, when it all came to an end and I had completed every static quest in the game. My character was so powerful that nothing stood a challenge anymore, and although I experimented with other hooks the game offered (punching dragons to death), none of it was the same. What I really needed was more content — more challenging places and quests to continue to use my bow. I jumped at the chance to get the Dawnguard DLC, but my elation didn't last long. (Mild spoilers) One of the first plot points that occurs in the new questline is watching your character be turned into a super powerful vampire. At first, this seems like it would be cool... until you realize that all of your new vampire spells require you to be in a strange ugly vampire form that prevents you from using weapons (and in fact everything but vampire spells). And that was not what I had signed up for! I just wanted more quests to use my bow on. While I could still complete this new storyline with my bow, it felt like I wasn't playing right. The game kept reminding me that I had an unused vampire form with traits like my character's new weakness to sunlight and desire to feed on blood. Again, I understand the thought that went into this expansion, but it really ignored what Skyrim players wanted: the ability to continue to play their awesome Dragonborn character that they had completed the main game with. I love Skyrim, and I get the desire to add new hook options into the game, but when that happens they really must be options. As it stands, not using the vampire in the vampire DLC feels wrong, while playing as the vampire is unfun. Crafting these kinds of lose-lose situations is bad design. Space Pirates and Zombies is a cute twitch piloting space shooter and RPG for PC. The player takes on the role of a ship captain in a post apocalyptic human colonized galaxy. Although the galaxy itself is a randomly generated sandbox with procedurally created quests, the gameplay still adheres very strictly to a main storyline. In game, you customize your ships for the hook that works for you. As with most games, my hook was outfitting my ships with stealth and then striking from stealth for damage bonuses and watching opposing ships' health melt before my eyes. I'm a big fan of the twitch piloting and spaceship upgrading RPG genre, as the story arc usually goes from having the player fight off minor enemies to giving her the ability to destroy fleets and space stations. This kind of mastery is very appealing to me, and while I wouldn't classify it as a hook due to its long term nature, it's definitely a draw. The cardinal sin that SPAZ commits is a design choice that I thought died years ago with some old Zelda games. As the player nears the final boss battle in SPAZ, the game saves for one last time. When the boss battle is complete, the player gets to see the final cinematics and the credits, and then is unceremoniously dumped back out to the main menu. If she clicks "load game" her only option is to restart from right before the final battle. Aside from the fact that this storytelling feels extremely unresolved, it also keeps the player from using her hook and exercising the mastery of the galaxy that she has evolved towards. This design choice is clearly to save on production costs, as it keeps the designers from having to include content acknowledging that the player has saved the world. While suboptimal, having hard endings in a game like Ocarina of Time is not all that problematic, as by the time the player has fought the final boss, she has basically experienced all of the content the game has to offer. By contrast, however, the procedurally generated sandbox world of Space Pirates and Zombies was not exhausted by the time I fought the final boss battle. I was through with the game; I wanted to go back into the galaxy and buy a few more ship upgrades and decimate a few more spacestations from stealth. In this day and age this design choice is a sin, and one that should be expunged from the game designer's arsenal for the future. Each of the design flaws I've noted above are ones that are very difficult to catch. In order to be seen, designers need outsiders' perspectives, because these choices really did seem like a good idea at the time. The bottom line is each of these three games are great, but they could be made even better by the designers sticking to their guns and weeding out gameplay that overrides, obfuscates, or prevents the player from exercising her hook, which is in the end what she is playing the game to do.